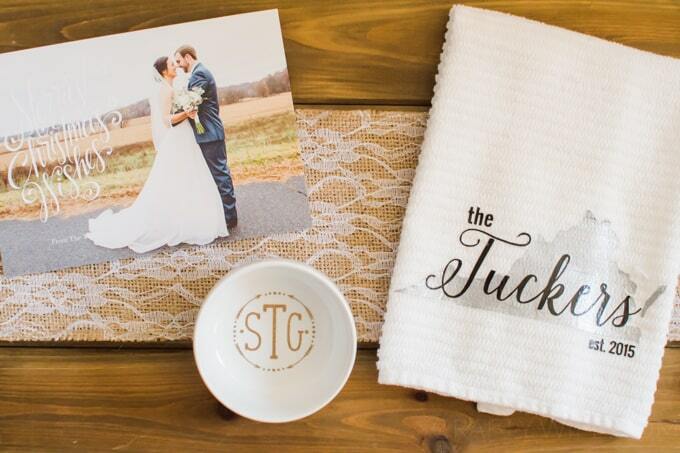 This personalized monogramed bridal shower gift is easy to make and will be a big hit with the bride-to-be! My little sister got married to her high school sweetheart last year, and it was the most beautiful rustic wedding I have ever been to! Their wedding had been nine years in the making and we couldn’t be more thrilled that her husband is now officially part of our family. 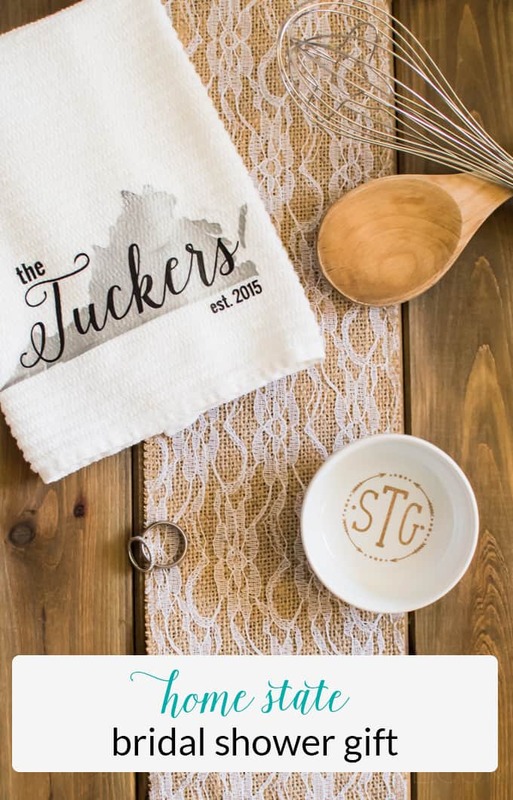 Because we were born and raised in Virginia we love anything monogrammed and personalized (really, who doesn’t) so I knew that was what I was going to incorporate into her gift. And because I’m super behind (a baby will do that, y’all) she actually didn’t get these gifts until Christmas. But, that’s okay. Better late than never, right?! I was so excited to give her these gifts, and she absolutely loved them! I’m getting more and more adventurous with my heat transfer vinyl so I decided to try something different and actually layer one design on top of other. Truthfully, it wasn’t as hard as I thought it was going to be and the result was fantastic! Remember to always mirror your image before cutting your design! I bought the Virginia silhouette from the Silhouette Design Store on my computer (but you could also trace it off of google if you’d prefer)! For the font I used Isabella (from creativemarket.com) for the name and Oswald (from dafont.com) for the rest. First, fold your towel the way you’d hang it off of your oven door and then measure across to see how big it is. Mine was 7 inches so that meant I wanted to make the design 6.5″ wide. 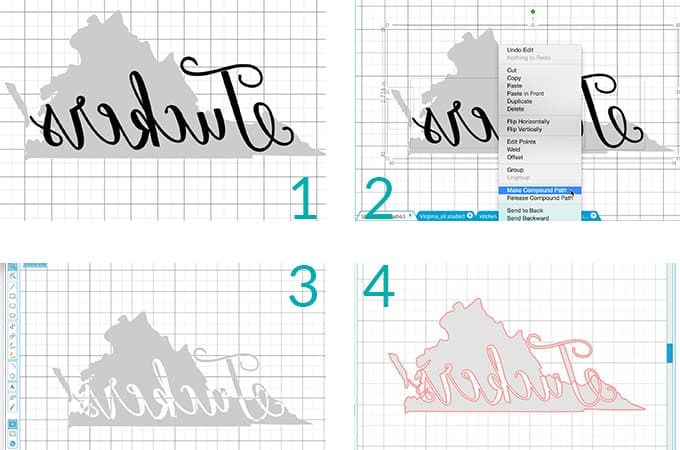 Type up your design in the Silhouette software and get everything the way you want it. Then mirror the image and delete the state behind the letters. Cut out the design, weed it, and set it aside. The next few steps correspond with the above pictures! 1. Undo your delete in the software and leave the last name and the state. Keep it mirrored. 2. Select the text and state and group them. Then right-click and select Make Compound Path. 3. Once you make a compound path it will cut out the letters inside the state for you. This is how your vinyl will look once it’s cut out. 4. Once you hit cut in your software you’ll have the red lines that trace the outside of your state and your letters. These are the cut lines! Once the image was cut I weeded everything, using the picture on my computer as a reference to make sure I pulled up all the right extra bits of vinyl! Then I put the state image on my towel, laid a pillowcase overtop the design (to protect all your hard work! ), and pressed with my hot iron for 45-60 seconds until it adhered to the cotton. Once that was done I lined up the text on top of the state and then used my iron to press that onto the cotton dish towel. You know the vinyl is adhered well when you can see the texture of the towel coming through! 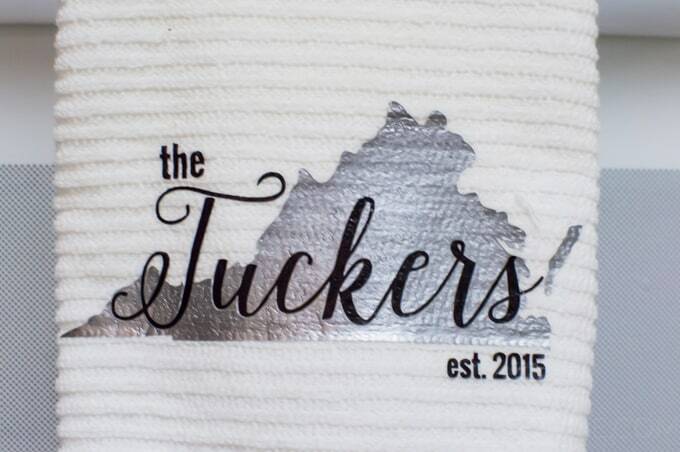 I am so in love with her home state gift towel, but since I had a set of four I needed a design for three more. 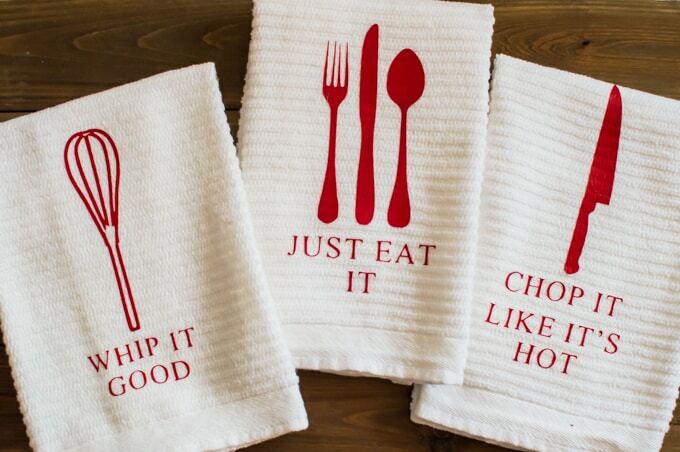 What better way to decorate a towel than with funny kitchen puns? I found the designs on Addicted 2 DIY and downloaded them to use for my sister. I love them. And everyone got a good chuckle when she pulled them out of the bag. You’ll make these the exact same way you make the home state towel, just make sure the designs are mirrored before you cut them! Don’t waste vinyl like I tend to do! My favorite type of gifts are personalized ones so it was really exciting to give my sister a gift that was personal. She loved it and I had fun making it. And now I need to make a trip to her house to see those towels in action. What are your thoughts? 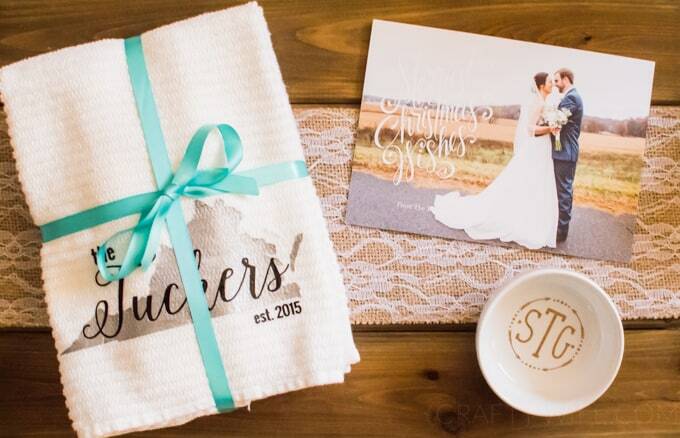 Did you get a personalized bridal shower gift or did you receive one yourself? Ok I LOVE how this gift turned out. I want to make all of the items for myself ASAP! Time to get started on HTV projects! Thanks, friend! 😉 Yes, you NEED to do some HTV projects! You’ll be hooked!!!! Oh my goodness! I LOVe these dish towels ~ espeically the state one! Well done and congrats to your sister. Thanks so much for sharing your creativity at the The DIY Collective this week! Thank you, Ashley!! I’m so excited with how the gift turned out, they were really fun to make. Thank you for such a great link party!